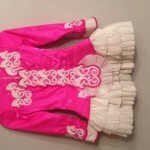 Bright pink bodice with white swirls on front which were described as butterflies by the dressmaker. 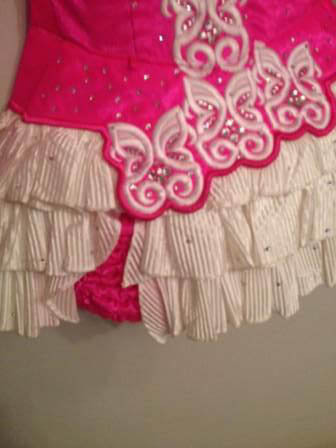 Skirt has 3 white ruffle layers with inset pink section. 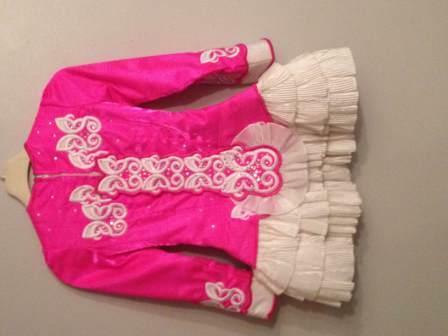 Has multiple small diamontes on bodice and front of skirt. Kept in non smoking home. All measurements are approximate and are in inches. Futher measurements will be available if required. Dress was let down previously so may be little left.